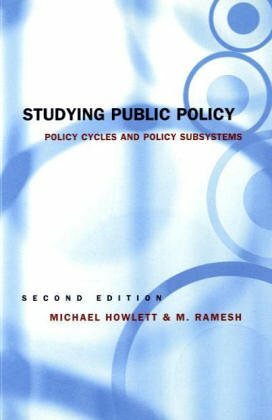 Studying Public Policy develops an analytical framework for its subject for use by students in public policy courses. Instead of focussing on substantive policy issues in particular policy areas, this book examines the theoretical and conceptual foundations of, and approaches used, in the policy sciences. Divided into four parts. Part 1 outlines the scope and parameters of the policy studies field and the philosophical basis of theories most common in the discipline; part 2 discusses the actors, institutions, and instruments found in public policy communities; Part 3 focuses on the policy process itself and how public policy is made; part 4 examines the phenomena of policy change. Michael Howlett is Burnaby Mountain Professor in the Department of Political Science at Simon Fraser University.